Two Ohio State researchers are among just 59 receiving five-year, 2017 Department of Energy (DOE) Early Career Awards to advance high-impact energy research. This puts them in an elite group of the nation’s top young energy researchers. 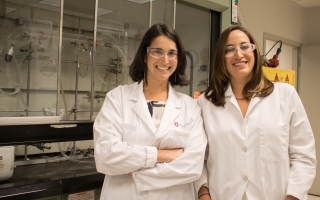 Hannah Shafaat, assistant professor in chemistry and biochemistry, and Kelly Wrighton, assistant professor in microbiology, join chemist Robert Baker, Ohio State’s first DOE award winner in 2015, and its second, chemist Abraham Badu-Tawiah, in 2016. Now in its eighth year, DOE taps into a nationwide pool of more than 700 researchers in universities and DOE National Labs to identify and support innovative work. Wrighton’s $797,000 award “targets knowledge gaps” in microbial methane processes in soil to improve carbon-cycling transport models across terrestrial-aquatic environments. Shafaat aims to “bring inorganic carbon to life.” Her $750,000 grant supports the development and characterization of model nickel enzymes to efficiently convert CO2 and CO into liquid fuels. Wrighton is passing the torch to the next generation, taking concepts and data generated to her environmental microbiology course, which educates approximately 40 undergraduate students every year. She received a Ph.D. in microbiology from UC Berkeley and was a postdoc at UC Berkeley and at the DOE. She said opportunities to cross disciplinary boundaries brought her to Ohio State, noting that a climate that encourages interdisciplinary research sparks new scientific projects like this one that grow out of ideas and insights of microbiologists, engineers and earth scientists. Shafaat came to Ohio State in 2013, and in 2015 received an NSF CAREER Award. Her group concentrates on developing simple model proteins that mimic large, complex metalloenzymes — ultimately to identify what it takes to build a robust catalyst for energy conversion. The DOE grant will allow Shafaat to expand efforts into the chemically rich world of carbon. She and her team are developing proteins that can convert the greenhouse gas CO2 — a product of fossil-fuel combustion — into energy-rich compounds. The research can ultimately lead toward developing carbon-neutral, sustainable fuels. This type of chemistry plays a key role in the metabolism of ancient microbial organisms and has been suggested as one possible mechanism for the origins of life, so this work will also provide an opportunity to learn about how these pathways may have evolved out of the primordial soup. “The most exciting thing about this grant is being able to support my students and provide more research opportunities,” Shafaat says. Shafaat’s projects cross many branches of chemistry, so her graduate students gain diverse expertise, a broad skill set and an appreciation of how interdisciplinary research can address global problems. Undergraduates have always been a key part of her research group and can now have multiple ways to make important scientific contributions. Shafaat received a Ph.D. in physical chemistry in 2011 from UC San Diego, where she was an NSF Graduate Research Fellow and a National Defense Science and Engineering Graduate Fellow. She was a Humboldt Foundation Postdoctoral Fellow at the Max Planck Institute for Chemical Energy Conversion. Ohio State was an attractive choice, Shafaat said, because it offers important elements for an assistant professor: great students and excellent resources, plus an emphasis and support for tenure-track professors to cultivate first-rate research programs.